Adaptations of old plays for modern audiences too often miss the mark because they seek merely to update, and end up doing so cosmetically. A contemporary setting, fashion-forward costumes, or the newest gadgets all shoulder the work of making a play current, with little concern for what makes the play currently meaningful. What is usually forgotten is that theatrical adaptation works best as a translation from one time to another, rather than an update. For a translation to make sense it cannot just look and sound like the language it enters, but must feel like it as well. And yet, a good translation also retains some of the force it once carried, even while taking on new meanings. Much of what makes the Guthrie Theater’s production of The Burial at Thebes effective is that it translates the famous tragedy of Antigone, and makes it deeply resonant rather than superficially familiar. Of course, The Burial at Thebes is a translation in the most literal sense. Adapted from Sophocles’ Antigone by the Nobel Prize-winning poet Seamus Heaney, it tells this classic story in a modern idiom. First performed by Ireland’s Abbey Theatre in 2004, the translation bears unmistakable traces of Bush Administration rhetoric during the initial years of the invasion of Iraq. King Creon’s appeal to “patriots” and disdain for “subversives” chillingly recalls the stark political oppositions created during those years. These pointed references never come across as dated, but seem ready to absorb new and different connotations. The same is true for other turns of phrase that feel distinctly contemporary, but not overwhelmingly so. It’s clear that Heaney does not take a universal appeal of Antigone for granted. He instead particularizes the drama, which also comes through in his use of meter modeled after an eighteenth-century Irish lament. A good script alone, however, does not a good performance make. Director Marcela Lorca brings this beautifully arresting play to life, and makes it move. It’s no surprise that Lorca often serves as the Gurthrie’s movement coach. Her expertise manifests in countless subtle gestures, many of which constitute the production’s best moments. A hand-clasp between Creon (Stephen Yoakam) and his son Haemon (Ernest Bently) that changes swiftly from tender to aggressive, for example, and the sweep of Eurydice’s (Regina Marie Williams) hand as it falls in desperation, add nuance to this story’s well-known clash of wills. Less subtle, but equally compelling movements appear in the dances and ambulation of the chorus (Lee Mark Nelson, Richard Ooms, T. Michael Rambo, Robert Robinson, Joe Nathan Thomas). These men weave intricately across the stage, shifting frequently in and out of unison as they comment on each scene. It is during the chorus’ debates that the sets and lights reveal their beautiful simplicity. 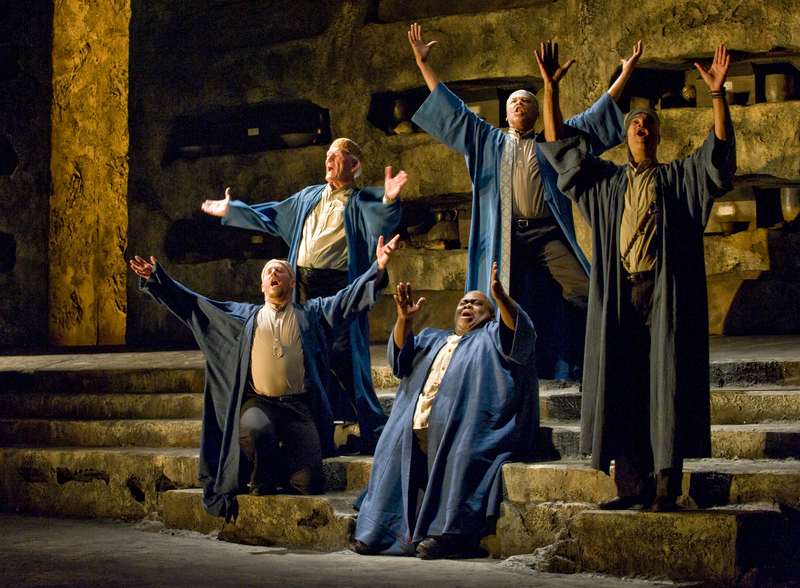 Designed by Monica Frawley, the set resembles a stone courtyard that is as vast as it is constricted, and the lighting by Christopher Akerlind frequently casts shadows on the walls, allowing the chorus to seem bigger in both number and stature. The chorus sings to music composed by J.D. Steele, a legend in the Twin Cities music scene. The songs are most effective when they strain at the tension between the classical and the contemporary, such as when they hint at gospel without fitting too neatly into this genre. At other moments the music comes across as too thoroughly contemporary, breaking the untimely quality of rest of the production. Nonetheless, when the music works, it works powerfully. Some of the most moving sounds come from Robert Robinson, who sings with an astounding range and amazing strength during the chorus’ deliberations. His haunting vocals also under-gird Creon and Antigone’s (Sun Mee Chomet) most intense laments. Unfortunately, the production does little to highlight the ties that bind Antigone and Creon, falling into an old trap that pits these tragic figures squarely against each other. It is true that they act against each other and seem diametrically opposed, but they can also mirror and mimic each other in strange and provocative ways. It feels like a missed opportunity to have so compelling an adaptation shy away from the stranger, less well-explored aspects of their conflict. To Lorca’s credit, the production does paint a more nuanced portrait of Creon than usually presented. It is all too common for his role to be little more than a caricature of a wrong-headed tyrant. In contrast, the Creon of The Burial at Thebes, who Yoakam plays deftly, instead reads as well-intentioned, if painfully misguided, and makes the tragedy more poignant. In fact, the Creon of this production is much more interesting than its Antigone. The Burial at Thebes resists the tendency to cast her as an uncomplicated and triumphant hero, as many modern adaptations do, but fails to provide an alternative interpretation. While Chomet’s Antigone is at some moments engaging, her mourning usually remains static. Again, a director as clearly capable as Lorca might well have investigated some of the weirder dimensions of Antigone’s grief and dissent. For example, why does she claim she would not have risked her life for a husband or a son? And how can she act of her own accord if the curse on Oedipus’ family acts on her? It is not entirely fair to fault the Guthrie’s production for failing to explore these questions that most adaptations elide. But it is a testament to the quality of their The Burial at Thebes that I found myself wanting them to push the nuances further. These questions aside, the production manages to bridge gap between classical theater and contemporary audiences by rendering it both timeless and timely. Saturday, October 1 at 7:30 p.m. – Sunday, November 6 at 7:30 p.m.